A Walk through the Kaysersberg Valley. Surprisingly good food (a blend of French and German) and excellent wines and beers. Unspoilt villages and comfortable accommodation. 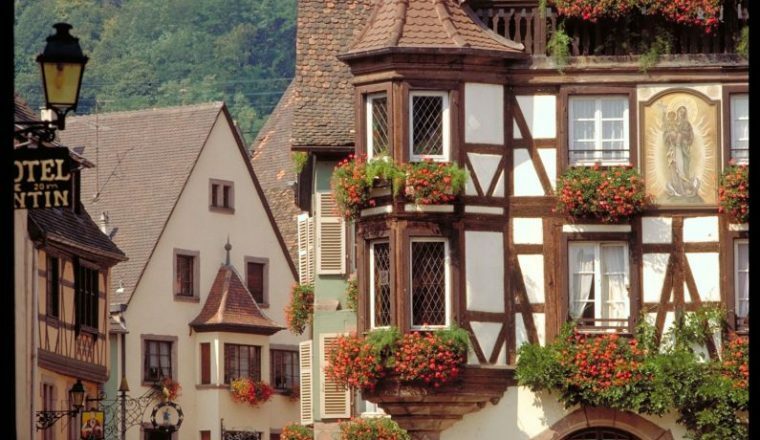 Alsace, the beautiful border region that has been the pawn of French and German politics for centuries, is resolutely French but with unique Germanic influences. 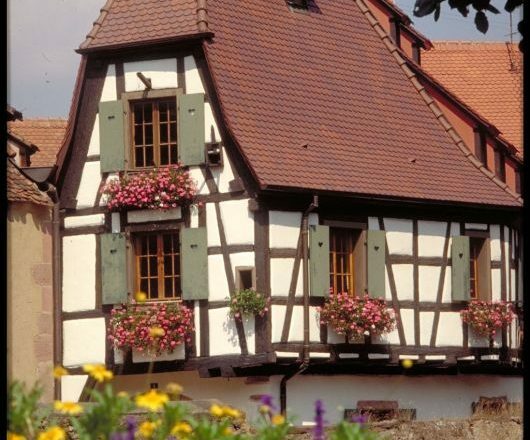 This area is the cross-roads between France and Germany famous for its beautiful scenery and excellent wines. This walking route is circular and takes in some of the most beautiful medieval wine towns and villages of the region. You walk along way-marked routes from village to village through woods, rolling hills, sunny valleys full of wild flowers and vineyard after vineyard where you can stop and taste the wine. Accommodation for 6 nights in family run hotels (2 and 3 star) in double rooms with bath or shower and private W.C.
Day 1: Arrive in Kayserberg. This lovely medieval town with its ruined 13th century imperial castle and fortified towers was once a free city and its former importance is evident in 12th century church with its renowned altarpiece dating from the 16th Century, its fortified bridge and renaissance town hall and beautiful crooked half-timbered houses. Settle into your hotel and explore the town. You will be given maps and route notes on arrivals. 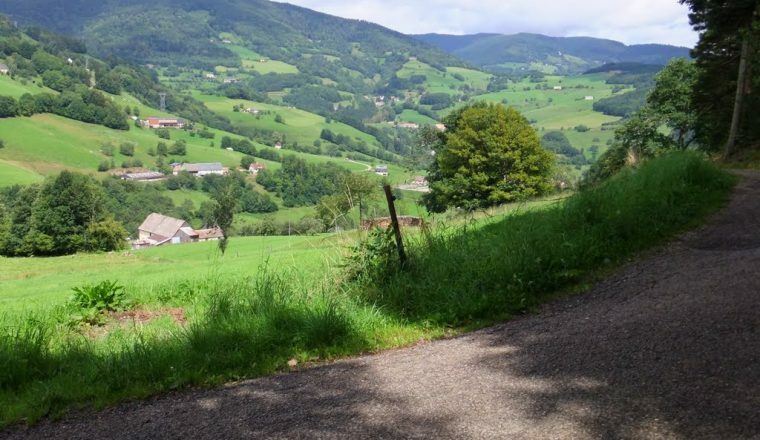 Day 2: Our walk takes us through the hills and valleys of the Vosges. We walk through green valleys, vineyards until we arrive in Lapoutroie, a pretty village in the heart of this valley – famous for its Munster cheese and wine brandies. Day 3: We continue our walk from the green valley to the hilltown of Le Bonhomme. We walk up to the top of Le Brezourard, which marks the northern boundary of the Upper-Vosges. From the summit (1229m) there are beautiful panoramic views to be enjoyed: to the north lies the Champ du Feu; to the northeast Strasbourg and on a clear day Mont Blanc appears from faraway on the south. Le Bonhomme (The Good Man) is a pleasant village of dairy farms. Our walk today follows wooden paths past former glacier lakes that are now peat bogs containing a great variet of flower and fauna including carnivorous plants which swallow insects. We walk past the observation post called ‘The Crow’s Rock’, used during to the First World War to observe the battle below. Walk past two great lakes until you reach your destination, Orbey, composed of five typical hamlets, important since the formation of the Abbey of Pairis in the 12th Century. The local Munster cheese comes from this valley (munster coming from the word for monastery “Monastere”). Today’s walk takes us to the pagan site of the Trembling Stones – a site used by Druids. The large slabs on the site are a mixture of sandstone pebbles of the Vosges mountains and flintstones. Later our walk takes us across the battle fields of the First World War. The battles along this area were called the War of the Trenches and the Linge Memorial Museum can be visited along the way. Overnight La Baroche. Our last day’s walks takes us back to the vineyards that produce the great wines of Alsace. 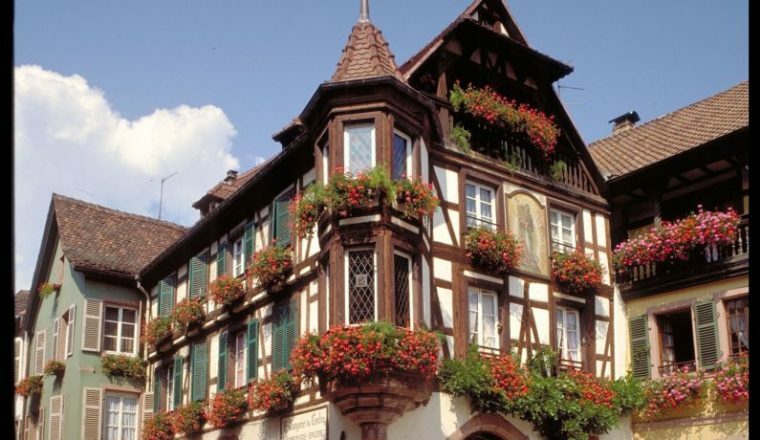 We walk through charming towns, such as Turkheim, an old walled city, with many houses dating from the 16th century, before arriving in Niedermorschwihr, a pretty village in the middle of vineyards with medieval house decorated with bow windows and balconies with colourful flower boxes. Day 7: After breakfast return to the railway station or your car. The nearest train station is Colmar. There are regular trains from Strasbourg and the journey takes under an hour. We will arrange for you to be collected from the station at Colmar and taken to the first hotel. At the end of the tour, you will be taken back to the train station. Strasbourg can be easily reached from Paris and several other airports. Ask us if you need assistance. Difficulty of walks; Walks are between 4 and 6 hours each day. Moderate walking.